Just about every team has seen it on their score sheet at least once: “Make sure to keep your energy up!” When you finally hit the dance portion, it can be challenging to stay excited and energized — especially if you had a fall or bobble at some point during the routine. However, your energy is one of the easiest things to control! Even your facials can go a long way. Here are some of our best tips and strategies to keep your energy high during even the most challenging portions of your routine. 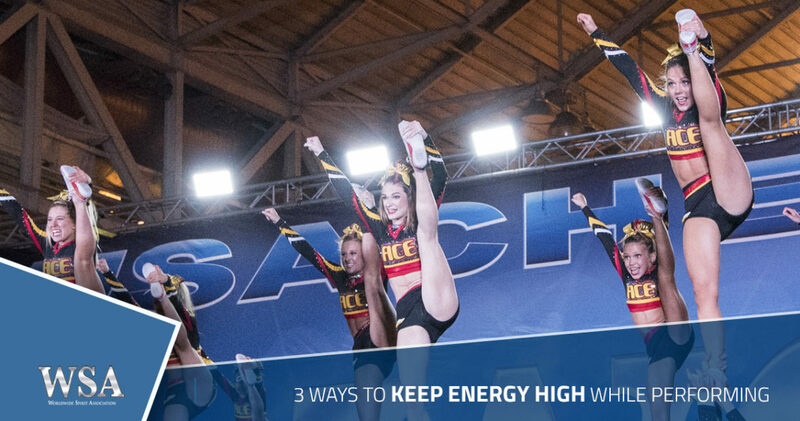 This one has to be worked on well before you go to the national cheerleading competition, but as long as you and your team are working hard at staying in shape, keeping the energy high should be a breeze. Think about it — while you may be able to hit your stunt sequence without an issue, how do you do when you have to do your running tumbling immediately after? Once that’s all said and done, are you ready for the pyramid? Judges are accustomed to seeing the energy fade as the routine goes on, but being in shape can help you easily keep your spirit up! No matter how in shape you are, you’re going to get tired. Cheerleading isn’t easy, no matter what level team you’re on! However, forcing yourself to smile and encourage your team is naturally going to boost your own energy levels. Come on, it’s only two minutes and 30 seconds. You can push a smile for that long. Besides, countless studies have shown that simply forcing yourself to smile can naturally raise your mood. Get happier, get excited, and get ready to show everyone what you’ve got. We can’t tell if your smile is fake or not, so own it either way. You may have heard that “practice makes perfect,” but this isn’t true. Practice makes permanent. If you spend your time in practice making pained faces while you stunt, keeping your arms loose during your dance, and jumping only at 80 percent of your best, surprise — even if you do try to give 100 percent on the competition floor, you likely won’t be able to. Why not? Your body isn’t used to that sort of energy exertion. It’s like walking a mile at every practice only to try to sprint a mile in front of a crowd a month later. You’ll burn out quickly and potentially jeopardize your team’s performance because of it. Put on the facials now. Put in the hard work NOW. The more you do at practice, the easier your performance will be. The best and most entertaining teams keep their energy, spirit, and smiles at their best until that very last beat. Your team can do that too. Sign up for the next WSA national cheerleading championship by taking a look at our upcoming events! We look forward to seeing you and your team on the mat.